VoIP phone service can take care of your global and mobility needs as your business expands to new locations and employees expect BYOD benefits. You can get phone numbers from all over the world and use them in any location on your computer, desk phone or mobile device. It’s easy to manage all your numbers and users in one online account, no matter how many locations you have. You can get a local or toll free number in almost any country, making it easier for international customers to reach you. Some countries like Denmark require that you have a physical address in the country in order to get a phone number there, but for most countries it’s as easy as a few clicks. You can browse phone numbers from over 50 countries here. VoIP phone systems are managed completely on the web. There’s no software to be updated, no hardware to be stored in closets and everything is managed through your web browser. You can have multiple offices and phone numbers around the world and still manage them all under one account. As long as you can connect to the Internet, you can access your phone system. VoIP service is location agnostic. You can move your IP phones to another country and they would work just the same, using the same phone number it was calling with before. Softphones enable you to make and receive calls from a mobile device or computer. 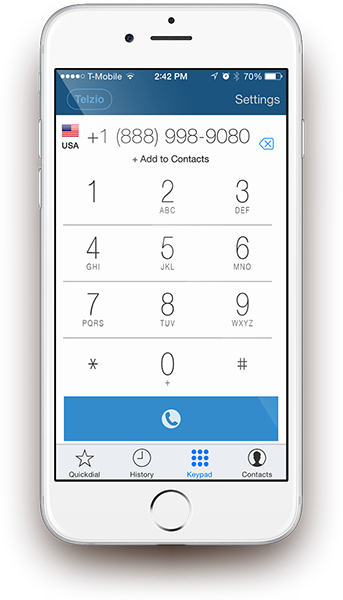 You can travel anywhere and manage business calls on your mobile device separately from your personal line. Telzio recently launched a mobile softphone app that integrates with a fully hosted VoIP system. Starting from $1 per month, the app and a full set of professional features come included. When comparing small business VoIP providers, you should ask yourself how many users you will need and who will be in charge of implementing your new phone system. Users -- Users are the extensions and phones you need connected to your phone system. You will find that most VoIP providers charge user fees from $15 to $70 per month per user, but you have other options. Plans from Telzio cater to small businesses and offer free users with all phone numbers. Instead of paying per user, you pay per phone number and add as many users as you need to each number. Usability -- Whether it is you or the IT person who will be setting up and managing the system, you want to cut down the number of hours it will take. Telzio has an easy-to-use admin panel and intuitive interface where you can be up and running in minutes. Built on the premise that anyone without IT experience could manage everything from start to finish, Telzio is the easiest way to get started with a VoIP phone system. You can see how the visual setup works at Telzio.com/demo. Plans -- In this world we live in, hidden language and fees are everywhere. Make sure you find the fine print and know what you’re getting yourself into, especially if the VoIP provider requires contracts. If something is described as “unlimited”, it usually has a “fair use” cap written somewhere else. Getting people to pay for more than they use is how those big phone companies make more money after all. Diana Chu is the Chief Executive Officer of Telzio and has over 10 years of experience working with small businesses. Diana graduated from the University of Southern California where she studied Business and Entrepreneurship. Frustrated with deceptive telecommunication companies and horrible customer service, Diana is focused on supporting small business owners through enhanced, efficient and transparent phone services.